At In the Spirit, we practice many levels of hatha yoga - the most classic form of yoga, as well as yin, flow, kundalini, therapeutic and Yoga Teacher Training. We also have Zumba classes, prenatal and Mom & Baby yoga. Custom Therapeutic, Yoga Tune-up Ball therapy, beginners/learn and various "shape-up/workout" classes. We have TWO studios that are both intimate and beautiful and our instructors provide each student with a more personalized approach to learning. 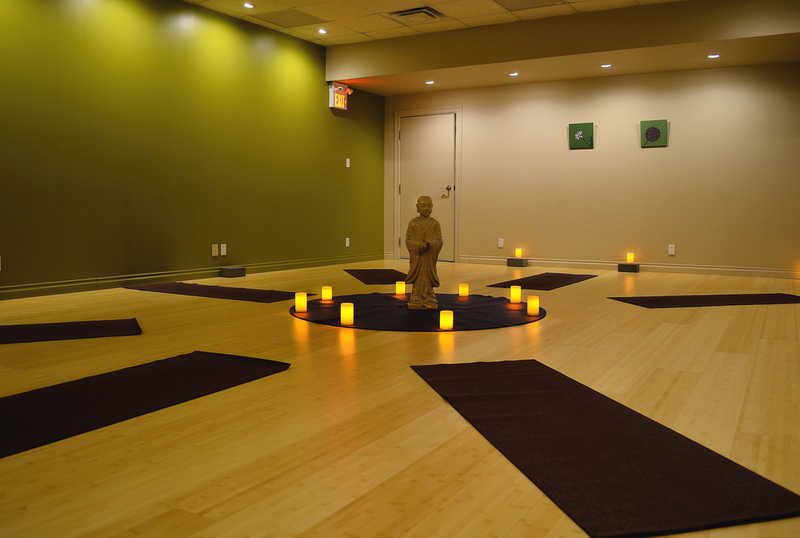 Specially designed, these are “non-intimidating” spaces for your practice, attention, and awareness; respect for each participant is always at the forefront of our minds. 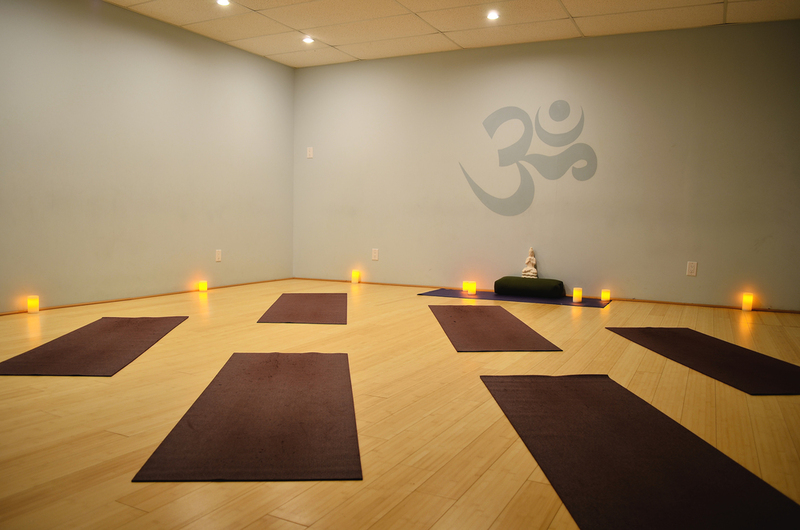 Within our compassionate and loving studio setting, you can unwind and stretch in safety, as we passionately believe in the practice of yoga and all of the benefits that it brings. Our beautifully appointed lounge offers a comfortable and inviting space that beckons you to come, relax and unwind. As a community gathering place, it is the perfect place to connect with friends and enjoy a beverage or light snack from our menu. Each morning, coffee, herbal tea and scones are available to enjoy. Later in the day, we offer a lounge menu of pates, cheeses, "not too wicked" chips and dips, desserts, etc. alongside our list of unpretentious, excellent, yet affordable wines. All wines have been selected by a certified sommelier and clientele from various wine tastings held at In the Spirit twice a year. Beer, soft drinks and mineral waters are also available. Anne brings a blend of humour, compassion, respect and connection to her classes; using movement, breath, mantra, stillness and meditation to improve the health and well- being of her students, and she’s continually learning and growing so that she can support others on their paths. Anne believes that Yoga can bring us back to ourselves, back to our true nature so that we can enjoy life in all its abundance. As an original founder of In The Spirit, Anne has taught with us since our inception and has completed her 1000 hour yoga therapy certification with Functional Synergy in Calgary (one of the few programs in Canada accredited by the International Association of Yoga Therapists). Anne also works privately with students to help them advance their practice, get out of pain, have fun and live the life they seek. Like a bird who instinctively navigates thousands of miles each year to nest in the same branch, in the same tree, something in us is always seeking this place of homecoming. When Debbie was first introduced to yoga, she instantly fell in love with it, knowing that she was well on her path to finding her way back home! Debbie is a reiki master and completed her yoga teacher training at Balanced Life Yoga. "Yoga – the simple act of making my breath calm, stretching and holding myself still – brings me a goodness within my body that is deeply and profoundly reassuring." Katerina believes that yoga therapy is the best way to deal with personal suffering, both emotionally and physically. Her approach to yoga is to use her practice as a means to help connect inwardly and find personal ways of self-healing. As an experienced yoga practitioner, Katerina focuses on adapting accessible yoga tools to serve the needs of the individual, honoring diverse body types and limitations. The result: self-awareness and love. Kat also specializes in restorative and pre & postnatal yoga. Alx, our teacher of teachers, has travelled and taught extensively, having practiced in various traditions with preeminent teachers in Canada, India and Peru. He specializes in many forms of yoga, including: jnana, yin, meditation, all levels of hatha, akhanda and classical kundalini. As many of you know, he is uniquely gifted in gifting others the resources for experiencing their own source. We’re not sure if Alx is “an old soul” or just extremely brilliant, but he brings with him a refreshing level of passion and perfection to everything that he does. He is constantly improving and adding to his endless skill set and we’re lucky to have him at In the Spirit. Ramona is a very dedicated marathon runner, but several years ago she discovered and fell in love with yoga as a way to stay injury-free and to strengthen her running muscles. Because she comes from a teaching background (specializing in Physical Education), it was a natural progression for her to attain her yoga teaching certification in 2010 and she’s been teaching yoga ever since. Ramona’s classes incorporate balance, flexibility, strength, and mental focus with dynamic movement in order to enhance communication between mind and muscle. Being sensitive to the needs of her students, Ramona will help you appreciate where you are in your practice and help to foster your growth. Lisa discovered yoga about 14 years ago, initially for the physical benefits that it provides. With increased practice, she began to develop a deeper self awareness and knew that this was the path she needed to explore. Lisa took her RYT 200 teacher training through East to West Yoga in Pickering, as well as certifications in Yoga for Kids, Yoga for Athletes and Zero Gravity Aerial Yoga. Through this journey of growth and discovery, yoga continues to bring a real sense of balance and positivity to her life. Lisa's hope is that through her teaching she will be able to help others discover and appreciate the many benefits of yoga both on and off the mat. Corey (Corinna) Besso is an accomplished bellydance artist. For over a decade she has been teaching and performing around the GTA. Specializing in Egyptian style bellydance, Corey has trained with some of the most accomplished bellydancers both from Canada and around the world. A former amateur boxing champion and coach, Tara first turned to yoga as a compliment to her boxing training. Even after she retired from the sport, yoga continued, becoming a constant in her life and guiding her to her true purpose—to gift back all that yoga has given to her. Tara completed her RYT-200 teacher training at In the Spirit Yoga and has a certification in Restorative Yoga. Tara’s classes provide a safe space for students to take an inward journey of discovery through movement, mantra and meditation, realigning each centre back into balance. As a young adult, Audrey taught popular forms of group exercise classes such as aerobics, step, and stretch. However, when she discovered how yoga combines the joy of expressive movement with mindful focus and spiritual grounding, it was natural for her to practice and eventually learn how to teach it. Her yoga journey over the past decade has taken her from weekly classes to daily classes in order to help keep her limber, and release the tensions and stresses of her demanding management position in the corporate world and “life in general”. As her practice deepened and increased, she studied yoga philosophy and meditation and after 3 years of dedicated pursuit, she attained her Teaching certificate (RYT200). She is also certified in further Yin YTT studies with Danielle March and is a Reiki Master. Knowing yoga to be universally beneficial, Audrey is particularly interested in the interface of feminine energy in today’s masculine world, and how breath unites the unique movement of the body with our divine spirit, multifaceted strengths and soulful intuition. Her classes are truly unique and very enjoyable for all. As one of the founders of In the Spirit, Deb’s “raison d’être” is to facilitate and accommodate the means to enjoy the wellness and wickedness of life. Her positive energy, drive and ambition, coupled with her wisdom, purpose and authenticity have created this harmonious sanctuary for all to enjoy. She is a “grapernatural” when it comes to wine selection - having been reborn in a small vineyard in Tuscany. Committed to embracing change and indulging our whims, Deb consistently adds improvements, creates unique events and opportunities, showcases and promotes local artisans and throws a darn good party! To know her is to love her. Suse passion for hospitality, excellent service and vintage wines, combined with her wicked sense of humour is a winning combination at In The Spirit. Compassion, tolerance and understanding are her touchstones. What can we say... she runs the place with the help of her amazing staff, and of course her bff and the owner, Deb Niven. Suse also enjoys horseback riding, candle-lit dinners and long walks on the beach -- see? Told you she was funny! Allison wears two hats and is the happy face you’ll see most weekday mornings in the Lounge as she registers you for classes and series, “puts on the coffee” (and tea, etc. ), and takes care of the many details in the Lounge and Yoga Store. In the afternoons, she moves to our offices in the back and puts on her Captain’s hat as the Chief Luxury, Adventure & Relationship Officer for The Divine Destination Collection, www.divinedestinationcollection.com. She’s a very busy woman, but she makes time for yoga (and occasionally, a good Sauvignon Blanc! ).